2 Bedroom End of Terrace Cottage For Sale in Cornwall for Guide Price £290,000. 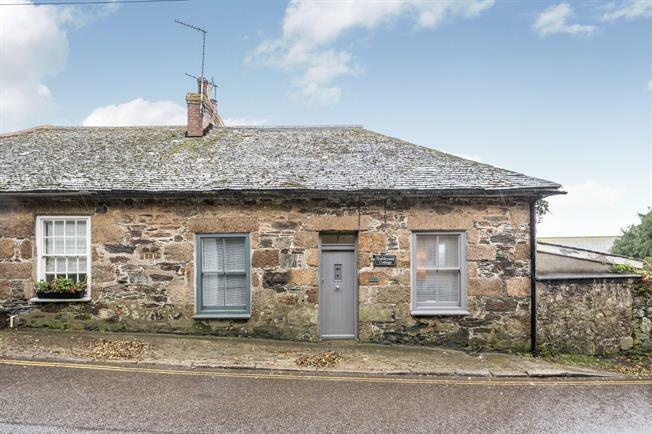 This charming Grade II listed granite built Cornish apartment retains many original features and character, whilst boasting contemporary charm and stylish decor throughout. The apartment is both light and spacious with lovely sea views from the open plan lounge/kitchen and rear bedroom. This property also boasts a decked and half enclosed outside space and allocated parking for one vehicle as well as garage. Wooden sash window to rear aspect with sea views, vaulted ceiling, wooden flooring, electric wall hung heater. Wooden sash window to front aspect, large breakfast bar area, vaulted ceiling, range of base units with integrated electric oven with halogen hob. Integrated fridge and washing machine. Velux window, corner shower cubicle with electric shower, sink with vanity units, W.C and heated towel rail. Wooden sash window to front aspect with slate window seat, vaulted ceiling and wall hung electric heater. Wooden sash window to rear aspect with sea views and partial St Michaels Mount views. Vaulted ceiling and wall hung electric heater. From the rear aspect there are steps up to a partial enclosed decking area for outside seating and dining. To the rear of the property you will find a garage with wooden doors and allocated off road parking in front of the garage with wooden doors.